Describe &quot;Fitt's and Posner's&quot; phases of learning and explain how you would structure practices to enhance performance. Describe "Fitt's and Posner's" phases of learning and explain how you would structure practices to enhance performance. 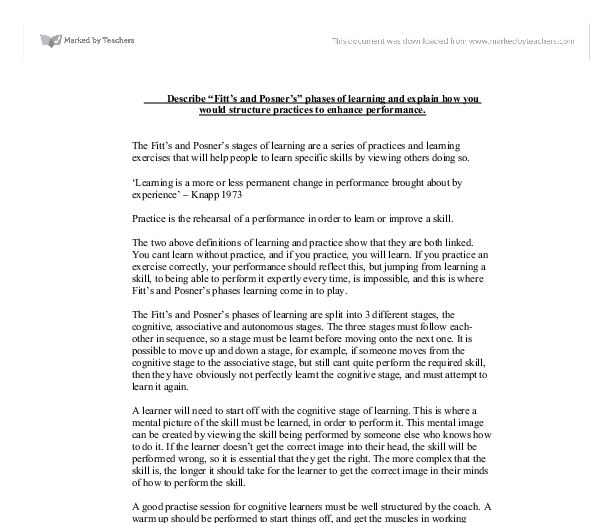 The Fitt's and Posner's stages of learning are a series of practices and learning exercises that will help people to learn specific skills by viewing others doing so. 'Learning is a more or less permanent change in performance brought about by experience' - Knapp 1973 Practice is the rehearsal of a performance in order to learn or improve a skill. The two above definitions of learning and practice show that they are both linked. You cant learn without practice, and if you practice, you will learn. If you practice an exercise correctly, your performance should reflect this, but jumping from learning a skill, to being able to perform it expertly every time, is impossible, and this is where Fitt's and Posner's phases learning come in to play. The Fitt's and Posner's phases of learning are split into 3 different stages, the cognitive, associative and autonomous stages. ...read more. Once the learner thinks that they have the correct mental picture, they must practice the skill with a partner, or with the coach, who will give feedback as to where the learner is going right or wrong. Once this phase has been mastered, it would be time to move on to the next phase. The associative stage is where the learner must practice a skill with verbal feedback and guidance from the coach. This will help them to improve the way in which they perform the skill. This help from the coach is very important as they must identify exactly what the learner is doing wrong to correct them. Also, the learner should look towards professional matches to see how the skill is performed by professionals, so that their idea of how to use that skill in a game situation grows. The coach will be able to start using more complex language to explain the skill as the learner should have started to build an understanding of what to do. ...read more. They can devise their own warm ups that should concentrate on the specific parts of the body used for the particular skill that they wish to practice, and should br able to use a skill in various situations, whether it be passing the ball between themselves and a friend in the park, or using that skill in a match situation where there are an unlimited number of option to place the ball to beat the opposition and complete the pass to a team mate. A coach will help them to improve their performance of the skill, and let them know if they are doing anything wrong. In conclusion, Fitt's and Posners phases of learning can be regarded as important for structuring any sporting practice. All learning seems to develop through these phases. However, Fitts and Poseners fail to realise that some learners may already poses the ability to perform the first stage of learning. Therefore, practices should take this into account, and maybe use these developed learners as demonstrators in the cognitive phase. 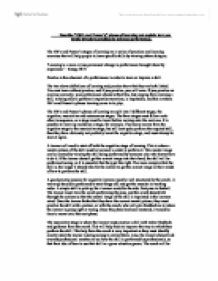 Word Count: 1009 Candidate Number: ...read more. Fitts and Posner's model identifies three phases or stages of learning. In this stage the aim for the learner is to begin to associate himself/herself with the feel of the movements with the end results. Although it is a step up form the cognitive phase it is still important to give feedback, but this time you must be more specific e.g. and then by pushing yourself back and upwards on the seat using only the tips of your feet. Application of Theory When doing a fitness regime, there are various principles of training that must be considered. Each one of these principles is important for your routine to be successful and for you to achieve your aim. There are many more factors that can affect the validity of the performance curves. A performance curve consists of three areas: * "The vertical y-axis of the graph, showing the level of performance being measured. * The horizontal x-axis of the graph, indicating the amount of time over which the performance has been measured. All success or faults should be recognised at this stage or the learner will learn to do the skill incorrectly. This helps the performer to realise why failure occurred so they know what to avoid the next time they attempt it. When I carry out my stretches I will stretch each muscle I will be working during training and its relative antagonist. I will hold each stretch for 8 - 12 seconds. I will use static stretches, as ballistic stretches are potentially harmful to connective tissue. The beginner is primarily concerned with what to do and how to do it. It is difficult for the beginner to perform the skill successfully in a game situation but they can spend time watching other players use the skill in the appropriate circumstance. Performance Analysis is an area of Sports Science that informs the coaching process through the provision of statistical and video information. Throughout professional sport there are many different ways of analysing sports performance. Throughout my assignment I will be applying many techniques to assess my sporting performance and ability. Two years later, in 1896, the first Olympic Games of the modern era were held in Athens. The ancient Olympics were revived. 2. The rules and laws for athletic events are set by the IAAF (International Association of Athletics Federations).